These dumplings can be a very nice side dish. Thoroughly defrost spinach, squeeze out of it as much liquid as you can. In a large skillet melt 4 Tablespoons butter. 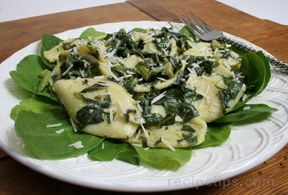 Add spinach and cook, stirring constantly until most of the moisture cooks away. Add ricotta cheese and cook a little longer. Transfer to a bowl. Mix in eggs, flour, 1/2 cup Parmesan cheese, 1/2 teaspoon salt, pepper and nutmeg. Refrigerate the mixture for 1 hour, or until it is quite firm. Bring 6-8 quarts of water and 1 Tablespoon salt to a boil. Pick up 1 Tablespoon of the chilled mixture at a time, shape into small balls, about 1 1/2 inches in diameter. Gently drop the balls into boiling water and cook uncovered for about 8 minutes, or until gnocchi puff slightly and somewhat firm to the touch. With a slotted spoon, lift the gnocchi out and set them on paper towels. 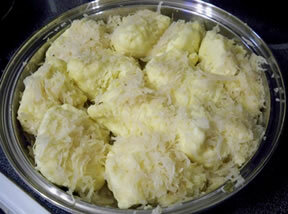 Put 4 Tablespoon melted butter in a baking pan, arrange the gnocchi in the pan, turning them to coat butter all over. Sprinkle the gnocchi with the remaining Parmesan cheese. 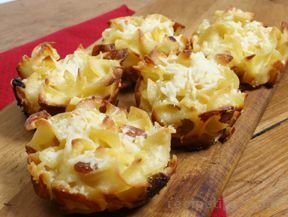 Set under a broiler, heat until the cheese turns slightly golden.